Initially almost two thousand candidates declared their intention of taking part in the election. This is a record in the history of the parliamentary election campaign in Azerbaijan. However, the number of candidates considerably decreased and even the main opposition parties including “Musavat” and the “Popular Front” were boycotting the vote. They have been calling the pre-election period unfair violations. A few days before the end of the election campaign "Musavat" announced the cessation of agitation and threatened to withdraw its candidates despite the fact that it’s against the law. The election campaign was not very active. According to the legislation, free television air time exceptionally can be given those parties which have more than 60 members out of 125 in the National Assembly. Only the ruling party “New Azerbaijan” that currently has 75 seats in the single-chamber parliament had such chance, but they voluntarily abnegated their advantages. President Ilham Aliyev's “New Azerbaijan Party” always received a majority vote in all previous elections. And this time the experts also have not expected sensational changes. All exit polls that were conducted by local and foreign companies indicated a victory for the ruling party. Firstly their political statements seem the most reasonable and their conduct is of a piece with words. Azerbaijan is fast progressing and has a strong economy though reduction of oil prices. Secondly the popularity of President Ilham Aliyev in the country is great. Citizens note that their living conditions have improved during the years of his reign. A relatively high percentage of Azerbaijanis are pragmatic on the issue and not ready to change stable life for unclear promises. People in Baku are proud to emphasize that greatness of the city is not the Soviet achievement but newly built. Furthermore experts consider that Azerbaijan has a developed fairly stable political system. For all these reasons, “New Azerbaijan Party” is leading in the election with at least 70 of the 125 seats (according to the interim results). Observers have assured that the elections were well organized and free. About 500 specialists, including from Russia and Europe, were observing elections. This year international monitors from the OSCE refused to participate, although Azerbaijan invited them. The OSCE was going to send the delegation consisted of 400 specialists. When Baku tried to figure out what the reason could be for such large mission, the OSCE said the government tried to restrict the number of observers in order to prevent effectively monitoring of the poll. Most analysts consider that the biased position of the OSCE about the election is a result of the disagreements between the Azerbaijani government with USA and the European Union. Europe asked Azerbaijan to join the sanctions against Moscow, but Azerbaijan refused. According the chairman of the Council of State Support to NGOs Azay Guliyev, Azerbaijan feel the pressure of the European Union and USA but the country does not want to spoil relations with Russia and aim at an independent, national-oriented policy. The European Parliament on 10 September adopted a resolution that criticized the Azerbaijan for crackdown on human rights. In response Samad Seyidov, the head of the Azerbaijani delegation to PACE, offered to freeze the activity of Baku in the Euronest Parliamentary Assembly. He said that criticism of democracy in Azerbaijan associated with corruption in the European Union, in particular in the European Parliament. He also accused the European Free Alliance in “cooperation with the separatists from Nagorno-Karabakh”. The country has its own unresolved conflict with Armenia in Nagorno-Karabakh. It is significant that in the conflict joined Turkey supporting Azerbaijan. Azerbaijan and Turkey are strategic partners and develop ties in the military sphere. There was intensification of military cooperation between Turkey, Georgia and Azerbaijan. In the period from 31 May to 10 June their armed forces hold a series of military exercises in the eastern part of Turkey – “Caucasian Eagle”. A few days before tactical exercises of Azerbaijani Armed Forces and Turkey were held in Baku. This is just a small part of exercises in 2015 joint both countries. The geographical position makes Azerbaijan a key strategic point at the junction of the routes to the Caucasus, Iran and Central Asia through the Caspian Sea. Azerbaijan is the most stable state in Transcaucasia. Two-thirds of Azerbaijan is rich in oil and natural gas. The Shah Deniz reserves are estimated at between 1.5 billion barrels to 3 billion barrels of oil equivalent from 50 to 100 billion cubic meters of gas. 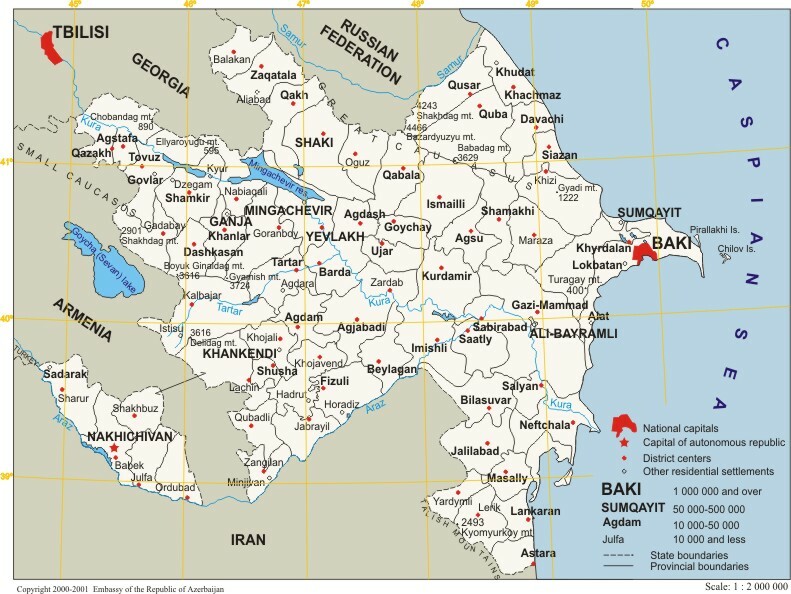 It is not a member to any economic unions, and this fact frees Baku from its obligations under them, allowing conducting an independent economic policy. That is why in the period of global crisis Azerbaijan has maintained its investment-grade rating, despite the fact that there was a reduction or changes in the ratings in neighboring countries. This gave the opportunity to start work on Southern Gas Corridor aiming to bring additional and alternative natural gas volumes to EU member countries (the Shah Deniz-2). In addition, the construction of Trans-Anatolian gas pipeline has began that will allow to transport gas from Azerbaijan through Georgia and Turkey to Europe. Azerbaijan has good potential for the transport transit not only from west to east but from north to south. Furthermore, positive trend is turning of Azerbaijan towards cooperation with Russia. SOCAR (state oil company of Azerbaijan) did not exclude the possibility of transporting Russian gas to Iran through Azerbaijan. Also Russia and Azerbaijan signed a deal concerning the encouragement and reciprocal protection of investments. The interest of Azerbaijan in Russia and the readiness to invest in the economy of the country is due to not only the widest range of opportunities, but also significant support that Russian regions give foreign investment partners. Azerbaijan is the most effective partner for Russia. In particular, at the beginning of 2015 direct Russian investments in Azerbaijan totaled more than 1 billion 400 million dollars. In turn, Azerbaijan has invested in the Russian economy about 200 million dollars. The joint cooperation of Azerbaijan and Russia in the fight against terrorism and organized crime is an important contribution to stability and security in the region. Actively implementing humanitarian ties are particularly important in the sphere of culture and education. Russia has strong community in Azerbaijan – the biggest in the South Caucasus – ad make an important contribution to the development of the country. Iran and Azerbaijan signed a Memorandum on railway construction to transport five million tons of cargo. Railway "North-South" will connect North Europe to Southeast Asia. It will serve as a connecting link the railways of Iran, Azerbaijan and Russia. The successful implementation of this project could seriously complicate the implementation of another, which also involves the participation of Iran — the construction of the railway Iran-Armenia, since Azerbaijan is a serious competitor in terms of transit territory.